Have we reached a state of “peak Android” in the same way that the energy industry can reach “peak oil”? This is an idea being floated today by Strategy Analytics . Last week the firm noted that Android partner Samsung was the world’s leading smartphone seller last quarter, taking just over 50% of the market. Today, it’s broken out what’s happening in the key U.S. market: Android sales actually declined by 5% over last year — and SA says Android may be “approaching a peak” in its market share. The analysts noted that in Q2, which ended June 30, U.S. smartphone sales trends reflected the slowdown that it has been seeing globally. 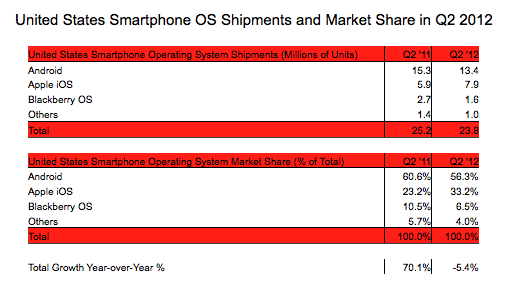 Total shipments in the U.S. stood at 23.8 million units, which was (like Android itself) a drop of 5% on the same period a year ago. Android, at 56% of all sales, remains the most dominant in the U.S. but Apple, the analysts noted, gained at Google’s expense and was the only OS to have grown over last year. Apple’s shipments totalled 7.9 million units in the U.S., giving it a 33% share of the market, up by 10 percentage points over the same quarter a year ago. RIM’s BlackBerry, meanwhile, is once again a testament to how quickly a decline can happen. The Canadian company saw its unit shipments and market share nearly halved; they are now at 1.6 million units and 6.5% of the market, as Apple continues to eat into its enterprise business and RIM faithfuls continue to hold out for devices built on BlackBerry 10 later this year. This is RIM’s lowest point in recent history, SA notes. And in a mark of ongoing consolidation around two dominant players, “others” (including Windows Phone from Microsoft/Nokia and other OEMs,) declined sales of just 1 million units for the quarter for a 4% share of the market. “This was one of the slowest growth rates ever experienced by the important U.S. smartphone market,” said Alex Spektor, associate director at Strategy Analytics, in the report. The reasons are the same as they are for the global market: economic issues; higher penetration of smartphones; and tighter upgrade policies to improve their own margins. Neil Mawston, executive director at the firm, meanwhile describes Android as “approaching its peak” while Apple’s iOS has been gaining ground. This is an interesting turn of events, considering that last week, Apple spent some time explaining why its own numbers were not actually very strong, citing in part users holding off purchasing until the next iPhone comes out, as well economic slowdown and the other issues. “Apple is rumored to be launching a new iPhone in the coming weeks, and that event, if it takes place, is going to heap even more pressure on Android in its home market,” he notes. One report earlier today even pinned a date on that event which is expected to have not only an iPhone 5 but also an iPad “mini” device. They will be revealed on September 12, notes iMore.